The following professionals are participating on the 7 final judging committees of the 2012 (6th annual) Stevie® Awards for Sales and Customer Service, the world's premier customer service awards, contact center awards, and sales awards. Final judging began on January 30 and will run through mid February. 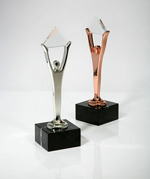 Their average scores will determine the 2012 Stevie Award winners. This year's Stevie Awards winners will be announced at our annual awards ceremony at Caesar's Palace resort in Las Vegas, NV, on Monday February 27. Learn more about the event and reserve your table today. We thank our judges for their enthusiasm, time, and insights.